Halle Hollatz. makes a play in the infield. 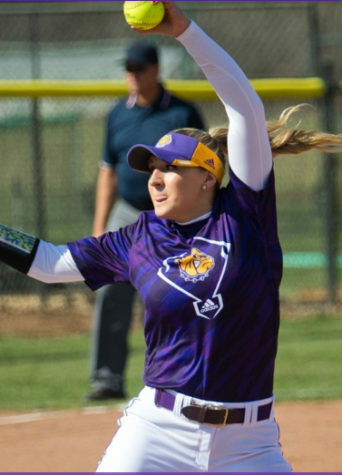 The weather affected the Western Illinois softball team’s schedule once more this season, but luckily Mother Nature was a bit more forgiving this time. The team traveled to South Dakota on Sunday to face off against the South Dakota State Jackrabbits in a three-game series this past Sunday and Monday. Game one pitted Leatherneck ace Emily Ira against Jackrabbits starter Morgan DeMarais. Western center fielder started off the game with a leadoff walk, but after being advanced to second on a Payton Abbott fielder’s choice, was picked off on her attempt to third. A fly out by Sydney Hollings made it a three up three down inning for SDSU. SDSU was able to find the scoreboard first when Julia Andersen doubled to left center, scoring Peyton Daugherty who was earlier hit by a pitch. The Jackrabbits added one more to their lead in the bottom of the second when pinch hitter Erin Mullen hit a two out double that scored one, bringing the score to 2-0. The pitchers were both hot for the next two innings as the two teams only combined for three hits in the third and fourth. Western’s bats started to warm up in the top of the fifth as three singles and a sac fly scored two, allowing Western to tie up the game. It wasn’t until the top of the seventh that Western’s bats caught fire. With two baserunners already on, SDSU intentionally walked Leatherneck power hitter Hailey Duwa to load the bases. Danielle Olson was hit by a pitch to score Jasmine Lara and take the lead. Halle Hollatz stepped up next and hit a grand slam for her first home run of the season, widening the Purple and Gold’s lead to five. South Dakota State couldn’t get any offense going in the bottom of the seventh, resulting in a 7-2 game one win for Western Illinois. Emily Ira earned the win for herself after pitching seven full innings, allowing seven hits and two runs while striking out seven, bringing her overall season record to 6-6. The playing of games two and three took place Monday in a doubleheader. Game two started off with SDSU taking an early 3-0 lead. They added one more to their lead when power hitter Ali Herdliska hit a solo home run in the bottom of the third. After scoring one more in the fourth, the Jackrabbits scored another two in the bottom of the fifth when both Herdliska and Mallory McQuistain hit solo home runs, giving SDSU a 7-0 lead. 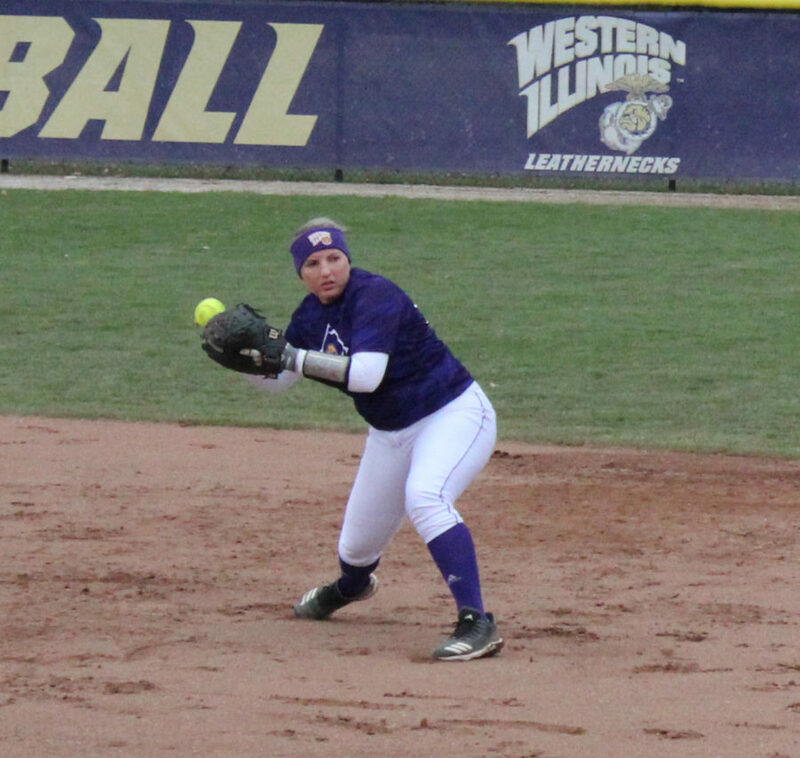 Western was able to score a lone run in both the sixth and seventh, but that wasn’t enough to earn a win as the Leathernecks dropped game two 7-2. Game three began the same way the other two did: SDSU scored first. This time it came off a Julia Andersen solo home run in the bottom of the first. The Leathernecks put themselves on the board in the top of the third after Lara and Abbott both reached base and Lara scored after Sydney Hollings reached on a fielder’s choice. Later in the inning, Aly Compton reached first on a walk. Abbott, Hollings and Compton were all driven in when Ira hit a double to right center, giving Western a 4-1 lead. The Jackrabbits scored one more in the bottom of the fourth. Western scored an insurance run in the top of the sixth. The Jackrabbits couldn’t make anything happen against the dominance of Emily Ira and Western won game three 5-2. Western took the series two games to one. Western travels to Chicago this Saturday for their last non-conference matchup in a doubleheader against the University of Illinois-Chicago. Game one of the doubleheader is set to start at 1 p.m.